Give tenants and owners 24/7 access to the information they want and need with our powerful Tenant and Owner Portal software solution designed to improve visibility and communication. It’s simple. Propertyware Tenant and Owner Portals provide secure, instant access to the information they need most, 24/7, and give you a convenient way to maintain 2-way communication. For owners, you’ll be providing a whole new level of real-time visibility into the performance of their investments. For tenants, you’ll make life easier by offering a way to pay rent online, communicate with your management staff, and submit maintenance requests. Have you ever been part of an email thread where the original message gets lost? The frustration of “he said/she said” tenant battles is real. Propertyware Tenant Portals give tenants one, centralized location to go to for communications with staff from any web browser or smart device. Tenants and staff are each notified via email when new comments are added to a communication stream. You can publish key documents to share to the Tenant Portal, too—they’ll stay secure and accessible. Sound familiar? It’s a fact that the USPS system is busy, so rent checks that may be in the mail may arrive after rent is due. Then, you have the burden of rushing to deposit it, hoping it clears. Instead, Propertyware allows you to offer your tenants an easy, effective method to pay rent online by either checking/savings account or credit card payments. No more waiting, no more stress. It’s simple. Now, when your tenants submit a service request, they can upload a photo or short video. This is helpful when there are multiple rooms in a home, so that your service technician can locate the specific issue more quickly and easily. Tenants can also track the communication between your team, anytime, anywhere. Deliver real-time, on-demand visibility to your owners. 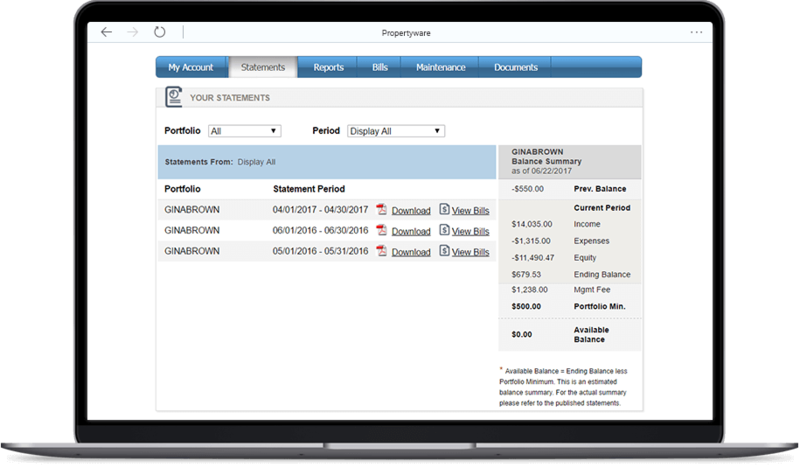 With Propertyware, owners can view their complete portfolio information including ledgers, documents and back-and-forth communication, delivering a level of confidence and trust they will appreciate. Whether you need funds from your owners or need to pay into the portfolio, our Owner Portals give you the power to transfer or receive money conveniently and securely. Completely integrated with the Propertyware owner ledger, the portal will notify your owners via email when funds have been added to their account, when tenants have given notice, and much more. Not sure who to communicate with? Not a problem. Owner Portals allow for all communication to be stored in one convenient location in the owner’s portfolio in Propertyware for future reference, so you never lose a conversation like you can with email. Listen to Bob Alleman of JWC Realty exclaim “WOW” as he describes how his inspectors upload their reports directly from the field into Propertyware Owner Portals so owners can access them in a matter of hours rather than the five days it once took.